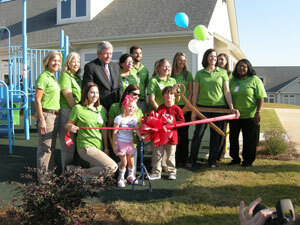 Pediatric services provided at our Opelika location. For more information, call 334-528-1964 (Opelika) or 334-710-0411 (Valley). RehabWorks’ Pediatric program, called RehabWorks 4 Kids, provides comprehensive, high-quality, compassionate therapies to help each child reach his or her potential. Our pediatric rehabilitation specialists – speech therapists, occupational therapists, and physical therapists – work together to provide individualized therapy for children with a number of diagnoses and needs. Our services are provided in a colorful, family-friendly environment. Minna was born seven weeks premature with a congenital heart defect called Total Anomalous Venous Pulmonary Return (TAPVR). This is a rare congenital malformation in which all four pulmonary veins do not connect normally to the left atrium. Instead, the four pulmonary veins drain abnormally to the right atrium (right upper chamber) by way of an abnormal (anomalous) connection. When Minna was five weeks old, she went into cardiac arrest for nine minutes causing her heart to stop. Oxygen to her brain was cut off which caused a grade 2 stroke on the right side of her brain. The stroke affected the learning center which we were told would cause some delays. It also caused Minna to have seizures, hypothyroidism, acute kidney injury, cortisol deficiency, and a nystagmus in both eyes. We chose RehabWorks after being referred by a physical therapist at UAB’s Newborn Follow Up Clinic. Minna was previously using early intervention and receiving occupational therapy. 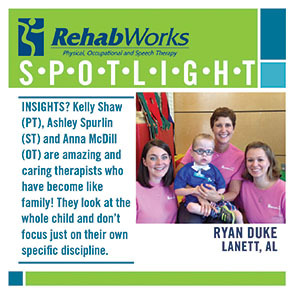 We immediately knew RehabWorks was the place for us once we met with Kelly, our physical therapist; Elisa, our occupational therapist and Mary Ann, our speech therapist. They’ve become like family and have made a huge difference in Minna’s life. She is like a new child - socially and physically. 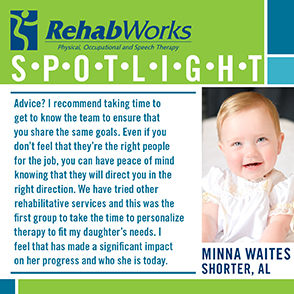 When Minna started with RehabWorks, she was 8 months old and she was unable to do anything other than lay on her back and wiggle around. She was very delayed and had an aversion to people. She was unable to eat by mouth and unable to talk. Minna is now seventeen months old and she’s almost completely caught! She can eat by mouth and is learning to talk. Our therapists took a unique approach by considering her past and customized therapy to fit her needs. They also involved family and created an emotionally-safe environment where she was not threatened. All of this made a vast difference which allowed her to be at ease and to learn successfully. In less than a year, Minna has become comfortable with her therapists and has been able to overcome her delays while steadily improving and catching up. I recommend taking time to get to know the team to ensure that you share the same goals. Even if you don’t feel that they’re the right people for the job, you can have peace of mind knowing that they will direct you in the right direction. We have tried other rehabilitative services and this was the first group to take the time to personalize therapy to fit my daughter’s needs. I feel that has made a significant impact on her progress and who she is today. Ryan was born premature at 25 weeks. We spent 19 months at UAB & Children’s Hospital due to a variety of infections and surgeries for a trach and g-tube. We were referred to RehabWorks by Dr. Brooke Williams of the Pediatric Clinic. His progress has been remarkable. He went from not letting anyone touch his mouth at all to letting us feed him baby food and yogurt 2-3 times a day. He couldn’t sit up on his own but he’s steadily made progress. He’s pulling to stand without any assistance! His grip has gotten stronger. He’s much less sensitive and more accepting of letting people help him. His communication and sensory skills are improving drastically. If you don’t immediately see improvements during therapy, don’t give up! You have to let the process work itself out. Don’t be afraid to ask questions and be an advocate for your child. Kelly Shaw (PT), Ashley Spurlin (ST) and Anna McDill (OT) are amazing and caring therapists who have become like family! They look at the whole child and don’t focus just on their own specific discipline. 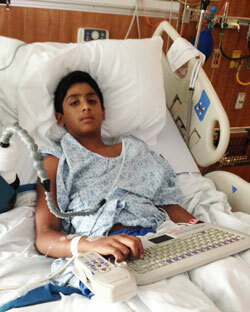 On the morning of June 8th, 2014, Ayan awoke unable to move or control his body. He fell out of bed and his father had to carry him. Within 10 minutes of visiting his pediatrician, Ayan was sent to Children’s Hospital by ambulance. After a series of spinal taps, CT scans, and MRIs over two days, he was finally diagnosed with Guillain-Barré Syndrome (GBS). 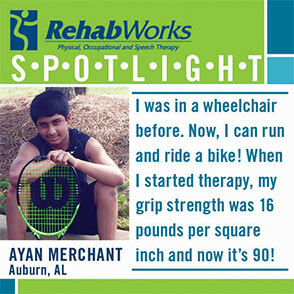 Ayan stayed in Children’s Hospital for 3 weeks and started therapy at RehabWorks as soon as he returned home. Parents: The physicians at Children’s Hospital referred him to RehabWorks because it’s the only rehab in this area that offers both physical and occupational therapy for neurological conditions. Parents: The therapists helped Ayan improve strength, balance, coordination, endurance, handwriting and many other things like feeding himself. At first, he was so weak that he couldn’t even scratch his own face or eat with utensils. After all of his therapy, he is now strong and working out at the gym for two hours at a time. Ayan: I was in a wheelchair before. Now, I can run and ride a bike! When I started therapy, my grip strength was 16 pounds per square inch and now it’s 90! Ayan: Having a happy attitude and staying positive will help you achieve results faster. Everyone is really nice at RehabWorks and the therapists are really great motivators. Mom: We really appreciate RehabWorks so much. It was so scary to see our active son go through this. Everyone here feels like family. We’re so grateful that his therapy allowed him to improve enough that he didn’t have to miss his 7th grade year. Clayton is a triplet. Sister is Maci. His identical brother, Jacob, is in heaven. Clayton was in the NICU in Atlanta for 5 weeks after birth. Dr. Thorne and Hattie Lett (Early Intervention) both suggested RehabWorks -- preferably therapist Kelly Shaw. I never thought I would be using physical therapy for my son but RehabWorks really helped Clayton achieve so many goals. We would not be where we are today without Kelly and RehabWorks. As an EAMC employee, I’m very impressed that we have such a wonderful place within our organization. Dale and Kristen at the registration desk are so nice and friendly. They welcome us and they always let our kids feed the fish. They look forward to it every Thursday. Thanks for everything RehabWorks! Amy: Malone suffered a traumatic brain injury while playing high school basketball in a freak accident. He lost the majority of his memory and had some motor challenges. 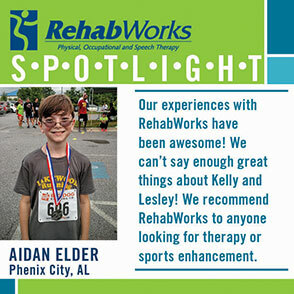 They worked with him on every aspect of recovery and really made him feel a part of the RehabWorks team. I had been a patient at RehabWorks a few years before Malone’s accident so I knew they would be thorough and caring in our very unknown and challenging situation. Malone: My mother’s choice of RehabWorks for my rehabilitation was a terrific decision. We would choose RehabWorks again, if needed. Amy: They were incredibly compassionate with me and helped me understand what he was dealing with so that I could be a part of his recovery. Malone: Therapy helped me recover from a serious brain injury. I had to re-learn the alphabet and the months of the year. After four years since my injury, I now have a 3.0 grade point average! If that doesn’t speak to the miracles that God can do through the beauty of therapy, I don’t know what else would. My therapy was rigorous and rough because of the amount of physical and emotional pain I endured. I’m now better than ever. I still have slight memory issues and motor malfunctions but to be where I am today is all due to the wonderful people at RehabWorks. Amy: Be honest with your therapists and talk to them not only about how you’re doing but what you’re feeling. Malone: The entire RehabWorks team is incredibly genuine. They care about you as a person just as much as they do about your recovery. Everyone knew my name and asked me how I was doing every session. It was an enjoyable experience and I would recommend it to anyone. 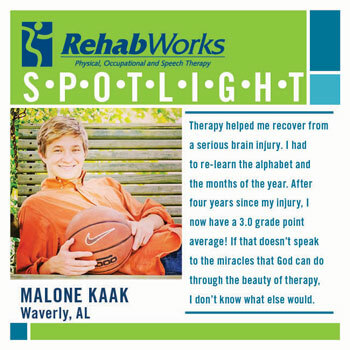 Amy: I’m so thankful that God used RehabWorks as a vehicle of healing for Malone. They were so incredibly supportive. Malone: I told all of my wonderful therapists that I would give them a “shout out” when I got back on the court. I’m BACK -- thanks to all of my therapists and the wonders they performed. Thanks to each and every one of you! I’ll never forget what you’ve done for me! God Bless! 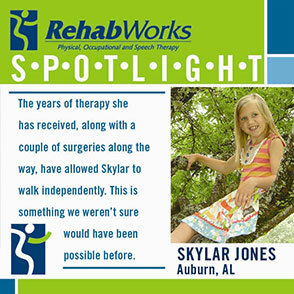 RehabWorks was recommended by Skylar's pediatrician after her diagnosis of Cerebral Palsy. She has bonded with all of the therapists so much that we couldn't imagine going anywhere else. Therapist Kelly Shaw and Skylar have developed a very special bond over the years. She has been working with her since she was one. Skylar looks forward to therapy every week. The years of therapy she has received, along with a couple of surgeries along the way, have allowed Skylar to walk independently. This is something we weren't sure would have been possible before. We highly recommend RehabWorks! From the office personnel to all of the therapists, we couldn't think of a better group of people. Not only are they great at their jobs, they genuinely care about their patients.